My son is two weeks away from starting first grade (gulp!) and this is the first year that his public elementary school will be requiring uniforms. Implementing standard student attire was suggested by the school administrators last semester, and in order for the rule to pass, at least 51 percent of the parent vote must be in favor. The uniform standard has slowly been rising among Clark County public schools, and is voted on a school-by-school basis. In the suggestion letter sent home, my son’s school principal included a list of pros and cons for standard student attire. Promotes safety by reducing the ability to hide weapons, drugs or alcohol. Fosters safety by identifying dearly students who belong on campus. Allows students and staff to focus more attention on increasing student achievement. Limits the creativity of a student due to an inflexible and strict dress code. May conflict with dress requirements or customs of some cultural groups. Is viewed as an additional cost. My husband and I voted for the change, and the rule was passed over the summer. I think uniforms will help lessen disruption in my son’s class– as well as on the playground. It also makes my job easier during our morning routine of getting ready for school, which is never anything less than total chaos. I’m a big believer in allowing my kids to make choices about their appearance and, for the last year, I’ve been encouraging them pick out their own clothes. On past days, I’ve sent my son to kindergarten wearing an orange shirt and blue and green shorts. Did it even remotely match? Nope. I held my tongue a lot but, if he liked it, then I was happy. This year, my kids can pick out their own school clothes, and I wont have to cringe when they come proudly strutting out of their room. The uniform list is simple, but it leaves room for lots of variation: black, blue or khaki pants and shorts. Skirts are permitted for girls. Jeans are also allowed. Shirts must be white, blue, green, yellow or pink. I’ve noticed that the style of the shirt doesn’t matter, as long as it doesn’t have any pictures or words on it. The only thing I wonder about is – will I have to buy an additional wardrobe for the weekends and after school? I’m not sure how that’s going to work yet, but the cost of having two wardrobes is definitely something I’ll need to figure out. Until then, I’m just going to enjoy the benefits and ignore the rest. 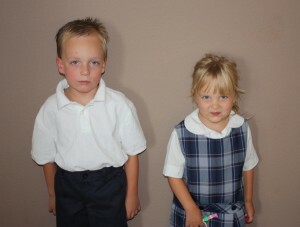 And boy, do my kids look darn cute in their uniforms! Visit the Clark County School District website to find out more about standard student attire. Yep, both kids look pretty cute, although your son looks like he’d rather be just about anywhere other than standing against that wall and modeling his new clothes…. Nice post and I’m sure one that will resonate with a few hundred parents this week. I’m a big fan of uniforms too. I think it makes life so much easier and I think it’s cheaper. So even if you have to buy additional clothes for the weekend you’re still ahead. No mention of shoes. Are there restrictions there? My daughter didn’t have uniforms (or at least, not in this sense, although she did seem to wear pretty much the same thing every day). But for the entirety of her high school career, she wore street shoes to and from school, and fluffy slippers on school grounds. In the entire four years, she was asked about it only once, when the principal inquired “Does your mother know you are wearing slippers?” She answered yes (not entirely honestly, I believe), and nothing more was ever said. Thankfully, there are no shoe restrictions other than socks must be worn (so no flip flops). Love the story about your daughter’s fuzzy slippers. Sounds like a fabulous way to spend the school day!